In early 2017, the dev team at Digital Extremes decided to create something brand new for itself and its players. We wanted to challenge ourselves in a different way. But what could we possibly do after four years of iterating, writing dozens of lore-based updates, continuously evolving our in-house engine, and creating 33 entirely unique Warframes? We wanted to give our players something they have never seen before. With today’s Plains of Eidolon announcement, we’re introducing Landscapes, a simple enough concept which eschews playing through randomly generated tilesets and instead offers a living space where players can discover, explore and experience a fully open environment. Welcome to Cetus, a makeshift town built by the Ostrons, a ragged group of survivors that make their living by scavenging and harvesting. But harvesting…what? 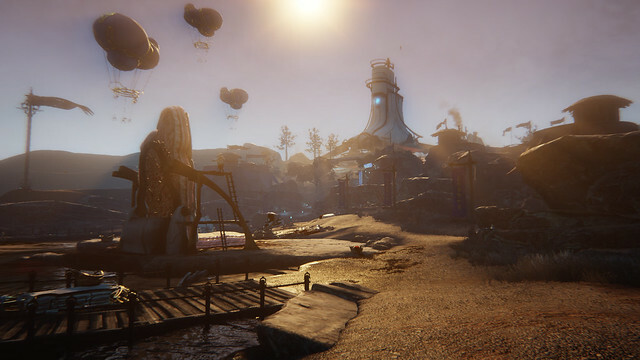 When players, or ‘off-worlders’ to the Ostrons, enter Cetus, they’ll see a wide-open environment bustling with life. The town itself resembles a tribal open market. Players will see a connected network of colorful tents that make up a Bazaar and, within it, an assortment of questionable vendors, food merchants, opportunists, all working to eke out a living. In the background looms the ominous Bleeding Tower, a giant living biomechanical construction that Ostrons harvest… Just outside of town a belligerent cadre of Grineer are mining for resources. But what exactly? 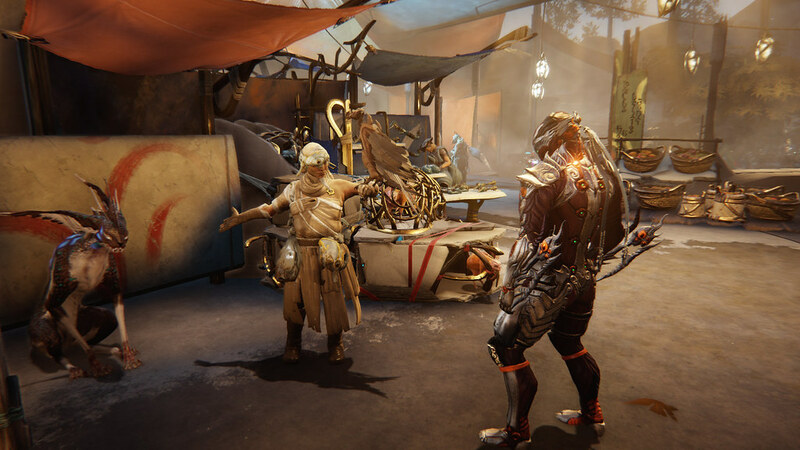 Unlike previous Warframe missions, Plains of Eidolon is set up to explore without a timer, with multiple mission objectives, and the ability to explore in numerous ways. 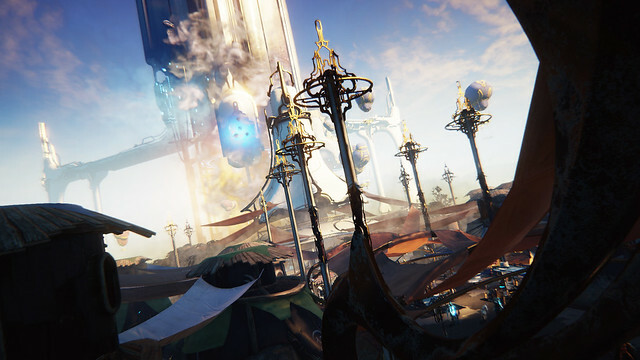 Cetus holds as many as 50 players at once, while the missions outside of town function like a traditional Warframe mission, grouping online squads of up to four to play together. The demo shows our team’s attention to detail visually and acoustically. From the mixed designs on villager clothing to the piercing volumetric lighting, which changes during the newly implemented diurnal cycle, to the groups of kids running around the dirt, wearing masks of the Warframes they idolize and the Grineer they hate, we hope that Plains of Eidolon will surprise veteran players, Acoustically, our sound team has created a cacophony of sound effects that will grab players’ attention as they walk through the Bazaar, with sounds ranging from close-up conversations, to obscure tribal music seeping through the soundscape, to the clatter of tools, all layered into the background. 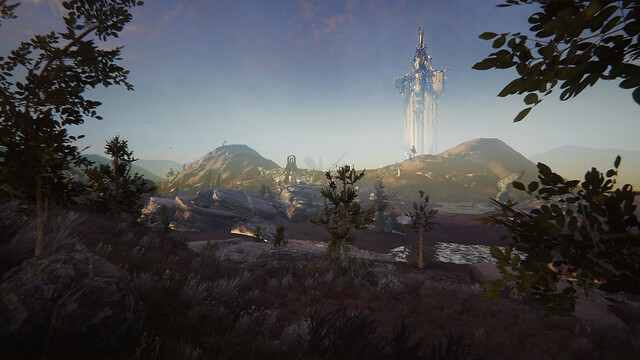 Upon finding a mission in the village, players can then depart Cetus and seamlessly transition into the wide-open Eidolon Plains where flocks or birds shift in space, vultures peck on indistinguishable food, and the rolling hills hide surprising forms of life. Players can follow numerous quests, but the one we’re showing in this debut demo involves some exploration, some goofing around – if one had a spear and was near a lake bustling with fish, what would one do…? And then there is the reintroduction of our previously announced Archwing — mechanical wings only used before in space or under water – which players can call in for fast travel and combat. And at night, at night, well, players will encounter the Spectral Sentient, a giant that haunts the Plain. Things move so fast in this industry: four years in the lifespan of a game feels like a century. Since our launch on PlayStation 4, nearly four years ago (we remember launch day, November 15, 2013!) we feel we’re embarking on something new, creative, and powerful. And, hopefully, for our devoted players, something unexpected. 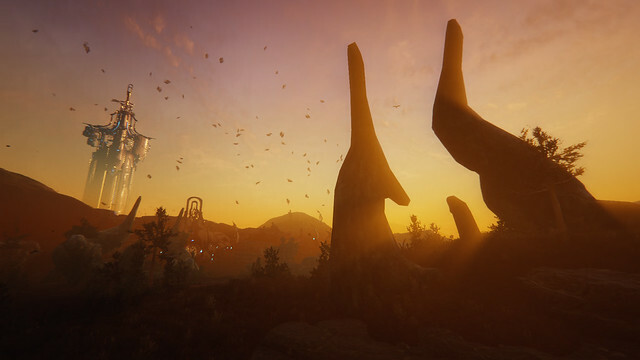 Let us know what you think of Plains of Eidolon – the way it plays, looks, and sounds when it launches later this year on PlayStation 4. We can’t wait for you to play it!